Myanmar’s renewed interest in coal carries broader risks for the administration. But although a more forward-thinking approach towards greener energy is desirable, renewables come with their own problems. Local and national opposition to a proposed coal plant in Kayin state, eastern Myanmar, has exposed Myanmar’s energy security dilemma. Activists argue the project will have a range of negative impacts, encouraging land grabbing; polluting air and water supplies; ruining local livelihoods; and exacerbating already poor public health across the region. Approximately one-third of Myanmar’s citizens have electricity access – among the lowest rates in Asia. Low energy security has particularly hampered economic growth and the livelihoods of citizens in rural areas, where electricity is most scarce. Nevertheless, focusing on coal power creates unnecessary risks and ignores viable renewable alternatives for rural communities. Under its National Electrification Project (NEP), the government plans to connect 100% of homes to the national grid by 2030. This ambitious 15-year project involves expanding the grid to a further 40,000 villages, drawing on investments of US$5.8bn. A central aspect of these plans is to increase coal’s total contribution to the grid from 3% to 30%. This represents a huge success for coal lobbyists, and reflects the industry’s revival across South and Southeast Asia. 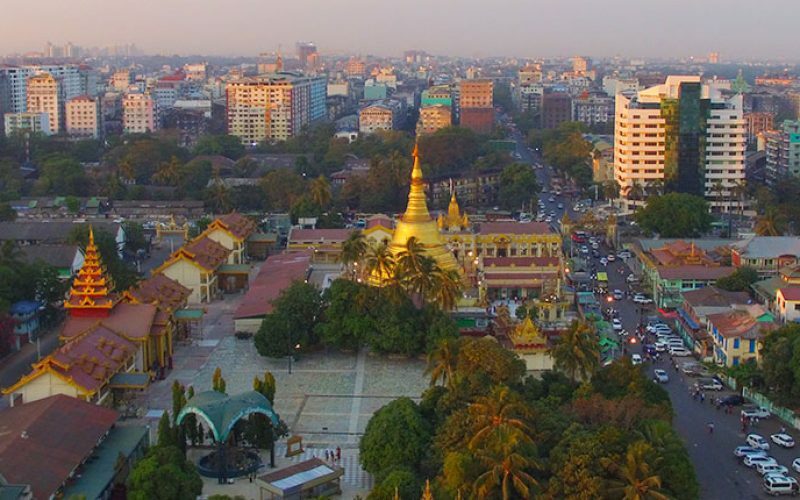 Major financial institutions have thrown their weight behind Myanmar, including the World Bank, the Asian Development Bank (ADB) and the Japan International Cooperation Agency (JICA). The World Bank has pledged US$1bn and provided a further US$400m in loans to expand the current grid, with the remainder coming from a variety of initiatives and foreign-funded projects. For the government, coal provides an efficient and cheap power source and will contribute greatly to Myanmar’s energy security. Data shows the Kayin plant alone will increase Myanmar’s total electricity production by 25%. Myanmar’s grid is currently over-reliant on hydropower, causing the country to suffer from regular blackouts during the dry season. 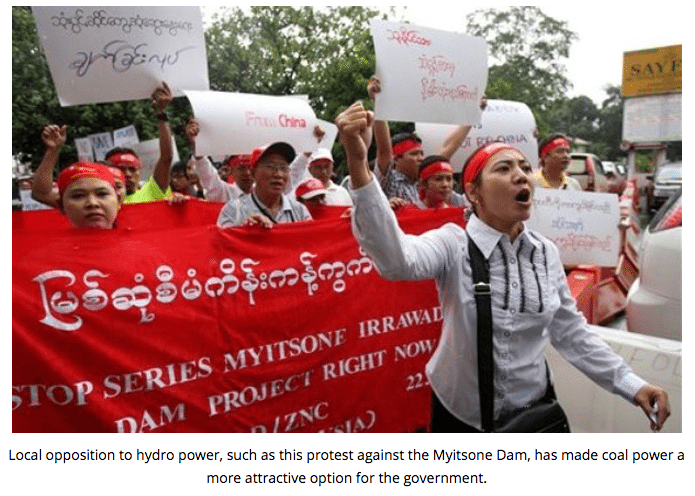 Opposition to hydropower has also grown due to the controversy surrounding the Chinese-backed Myitsone Dam, causing delays to most of Myanmar’s other planned hydropower projects. NLD spokesperson Win Htein noted the potential value of coal in locations where hydropower no longer seems viable. The government plans to proceed with the Kayin state plant, one of eleven plants commissioned under the NEP. It will be run by the Thailand-based Toyo-Thai Corporation Public Company Limited (TTCL). Despite coal’s reputation for contributing to global warming, TTCL intends to employ ‘high energy, low emissions’ (HELE) technology to mitigate the adverse environmental effects resulting from coal burning. As previously reported, this ‘clean coal’ technology has attracted interest from a host of countries, including Australia, India and China. HELE technology is still under-researched. 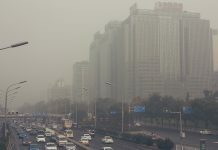 For instance, the best methods of dealing with the pollutants that are not filtered out (nitrogen oxide, sulphur dioxide, and other particulates) are still unclear. This is important considering Myanmar’s high vulnerability to climate change’s negative impacts. Clean coal is also more costly, although costs may decrease with further research and development. ‘Clean’ or not, coal extraction remains controversial. Mining has a long history of opposition in Myanmar. The Ban Chaung coal mine in Kayin state has faced resistance for many of the same reasons as the planned power station, namely environmental and health problems, land seizures and other human rights violations (concerning which Myanmar has a long and sorry history). Villagers are well-educated on the costs and benefits of energy projects, and adept at generating community opposition – the chief element behind stalled projects. The majority of Myanmar’s coal is low quality; hence the government will need to import expensive bituminous coal for these new plants. As Naing and Lee observe, this ‘would mean an outflow of dollars from a country with tiny reserves of hard currency’. To handle the vast quantities of coal imported annually, experts anticipate the need for a new sea port, creating further economic and logistical strains. By proceeding with these plans, the NLD risks jeopardising the support it has gained in Kayin state. Moreover, resource politics is deeply entwined with the tensions between different ethnic militias. 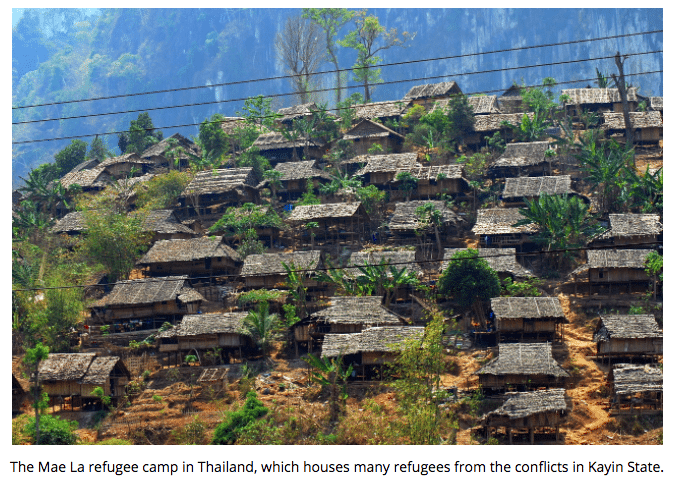 Although a ceasefire has been observed since 2011, peripheral regions – like Kayin and Mon – remain volatile and vulnerable to clashes, particularly over land and resources. Historically, there has also been collusion between members of these armed groups and military officials. NGOs believe there are opportunities for greener solutions. Renewables are abundant, cheap, quick to install and well-positioned for off-grid needs. Solar, wind, biogas and small-scale hydro-technologies have positively impacted rural communities. These markets have received much attention in Thailand, and Myanmar should take heed of its neighbour. Under the NEP, Myanmar has made some commitments to renewables. The cumulative target by the end of 2021 is to install solar panel units in 456,500 homes and ‘mini-grids’ (which draw on any combination of the aforementioned technologies) in 35,500 households. However, the NEP favours coal, gas and big hydro, and is not forward-thinking enough regarding renewables and the growing market for household-scale solutions. Whereas Thailand’s target contribution from renewables is 40%, Myanmar’s is just 5%. One of the contributing factors is the limited role of Myanmar’s private sector. 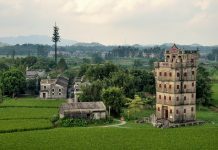 Responsibility for off-grid rural electrification falls under the agriculture ministry – and not the energy ministry – which has hampered private-sector participation in renewable energy projects and prevented a unified policy framework concerning off-grid rural electrification. As a solution, more power should be devolved to each state’s own energy ministry. As Myanmar continues to liberalise after years of underinvestment and underdevelopment, energy security will represent its Achilles’ heel. Clearly, the government believes renewables will be unable to meet the country’s growing energy needs. Nevertheless, embracing ‘clean coal’ risks magnifying Myanmar’s myriad environmental, social and political problems. Next articleWill Investors Sound the Alarm Bell On Rising NPLs Of Greece’s Five Largest Banks?